In an effort to keep Floridians informed of the state’s efforts to protect the environment, wildlife and economies of the communities surrounding Lake Okeechobee and the Caloosahatchee and St. Lucie estuaries, the Florida Department of Environmental Protection will issue a Lake Okeechobee status update each weekday. These updates will help residents stay informed of the latest rainfall and lake level conditions, as well as the latest actions by the State of Florida and U.S. Army Corps of Engineers. By raising the L-29 canal level, per an order from the U.S. Army Corps of Engineers and at the request of Governor Rick Scott, the South Florida Water Management District has been able to move approximately 1.44 billion gallons of clean water (water that meets water-quality standards) into the northern portions of Everglades National Park, as of midnight on Feb. 18, 2016. On Feb. 15, 2016, the U.S. Army Corps of Engineers agreed to Governor Scott’s request to raise water levels in the L-29 canal in order to move water south through Shark River Slough to ease the effects of flooding in the Everglades. The South Florida Water Management District began operation of the S-333 structure at 5:30 p.m. on Feb. 15, 2016, after the state received an execution order from the U.S. Army Corps of Engineers. The discharge rate is averaging 1,200 cubic feet per second, or 540,000 gallons per minute. On Feb. 11, 2016, Governor Rick Scott requested that the U.S. Army Corps of Engineers take immediate action to relieve flooding of the Everglades Water Conservation Areas and the releases of water from Lake Okeechobee to the Caloosahatchee and St. Lucie estuaries. Click here to read the letter. 8.5 feet so that substantial volumes of water be moved from Water Conservation Area 3 to Everglades National Park through Shark River Slough. The Florida Department of Environmental Protection and the Florida Fish and Wildlife Conservation Commission (FWC) issued orders on Feb. 11, 2016, that would allow the U.S. Army Corps of Engineers to move forward with this request. Click here to read the orders. The FWC continues to monitor water levels and the status of wildlife in three of its Wildlife Management Areas (WMAs) in South Florida that encompass a total of 736,881 acres within the Everglades ecosystem. These WMAs provide important habitat for a diversity of imperiled wildlife species, including the Everglades mink, Big Cypress fox squirrel, little blue heron, tri-colored heron, snowy egret, white ibis, wood stork and limpkin, as well as native and abundant species like American alligators, white-tailed deer and marsh rabbits. FWC’s monitoring efforts include periodic wildlife and habitat surveys. FWC staff continues to watch water gauges to monitor high water levels and the impacts and stresses they may be having on areas like the Everglades tree islands, which are critical to the survival of Florida wildlife species. High water levels can seriously impact nesting and feeding activities of our native birds and make large and small mammals much more vulnerable to disease, starvation and predation. The condition of habitat on tree islands is an important indicator for the level of stress being experienced by wildlife. Last week, FWC conducted wildlife and habitat surveys in Water Conservation Area (WCA) 3A South in Broward and Miami-Dade counties. Habitat conditions on tree islands are indicating light use by wildlife at this time. A low number of deer were observed on tree islands. Feb. 18, 2016, the discharges from the structures operated by the Corps are at levels that lower salinity and impact the estuarine ecology. 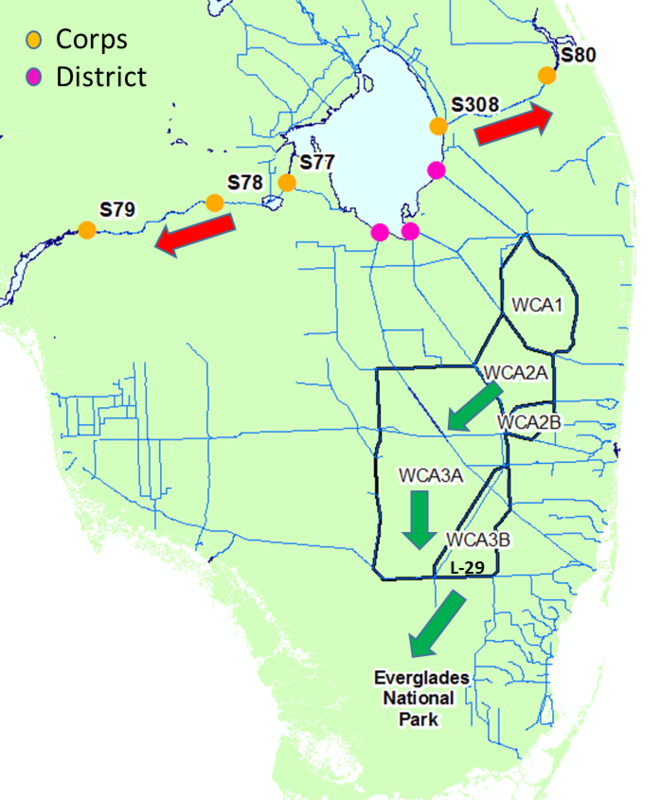 The green arrows show the movement of water from the water conservation areas into the L-29 canal at a protective amount for Everglades National Park. The District began this movement on Feb. 15, 2016, after receiving an execution order from the Corps at the request of Governor Scott. to the actual daily average releases. Caloosahatchee Salinity Conditions: Salinity (based on optimal conditions for adult oysters) increased and are in the good range at Sanibel, within the fair range at Shell Point and in the poor range at Cape Coral. St. Lucie Salinity Conditions: Salinity at the U.S. 1 bridge remains the same and continues to be in the poor range. In January 2016, South Florida experienced the wettest January on record since recordkeeping began in 1932. Over the past three days, there has been no rainfall over the region. Rainfall for the current week is forecast to be average, and the following week is forecast to be above average. Significant rainfall over the region is not anticipated for the next three days. If you would like to continue to receive DEP's Updates on Lake Okeechobee, please click here to subscribe.